I write this having just spent the day with our spirited and talented seventh- grade class, five of the most dedicated and inspiring colleagues anyone could ask for… oh, and Supreme Court Justice Anthony Kennedy. 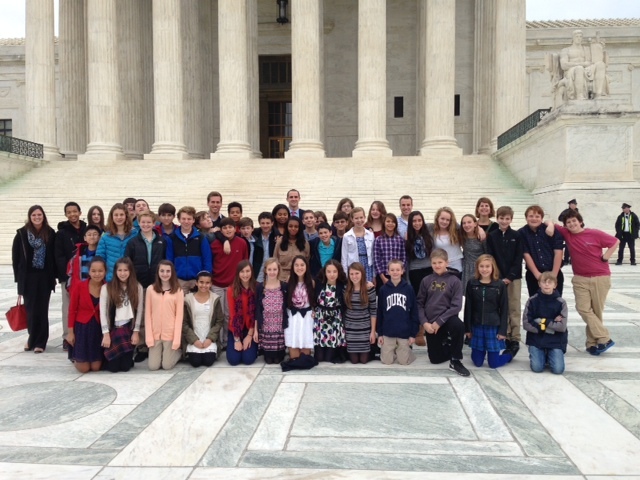 After a morning spent touring the U.S. Capitol, our social studies field trip group moved on to the Supreme Court where we were treated, thanks to a Langley parent who had clerked for Justice Kennedy, to a private half-hour session with the justice and one of his clerks in the Lawyers’ Lounge of the land’s highest court. While we know Justice Kennedy to be a powerful Constitutional scholar and leader, we were all struck by his engaging manner with our middle school-aged students. He was remarkable, and the students (and faculty!) left the meeting a bit star-struck and ready to review our copies of the Constitution when we arrived home, per his suggestion. A field trip like this certainly makes me, a native of Boston, feel lucky to live and teach in the metro-D.C. area. What I thought about on the bus ride back to school, however, was how lucky I am to teach middle school in a preschool to eighth grade school. In a K-12 school, it would certainly not be the seventh-graders who were chosen for a plum opportunity like this. Private audiences with Supreme Court justices would be reserved for the upper school Student Council or the AP U.S. history class. Middle school students at Langley, as we know well, are our leaders. They are the ones to whom younger students look for inspiration and mentorship. We look to our middle schoolers to represent us internationally in Costa Rica or locally by volunteering at So Others Might Eat (SOME), and we are never disappointed. We are proud when they leave the Langley nest and live our shared values in their new high school communities. Recent studies out of Columbia, Johns Hopkins, and Duke universities have borne out what Langley parents have known for decades. PK-8 schools provide an approach that both meets the unique developmental needs of their students and provides for superior academic achievement, particularly for those in their middle school years. While these studies largely investigated public middle school settings, they provide research that supports what I regularly posit to anyone who will listen: this is the best model for kids, period. We know that in K-12 schools, resources and attention are disproportionately given to upper school programs. How lucky we are, as teachers and students at Langley, to work and learn in an environment that celebrates the unique developmental stage that occurs during the middle school years, rather than one that makes students wait until they reach the capstone high school years to discover their passions, to have authentic leadership opportunities, to stretch themselves academically. As Justice Kennedy told our seventh-graders, they will inherit this democracy very soon, and they have a responsibility to understand what that entails. I am confident that our students will understand and be equipped to take on that mantle in myriad ways. And they will be able to do so thanks in large part to the opportunities they were afforded during their formative years, the preschool to eighth grade years at The Langley School. This entry was posted in By Kathleen Smith and tagged Costa Rica, Education, Justice Kennedy, Middle School, SOME, Student council, Supreme Court by langleyleopards. Bookmark the permalink.